Mr. Haresh M. Jagtiani is a Senior Advocate of the Bombay High Court and the Founding and Managing Partner of Oasis Counsel & Advisory. He has extensive litigation and arbitration experience and has represented clients in commercial, criminal, constitutional, civil, maritime and matrimonial disputes as well as disputes relating to income tax, power and electricity, intellectual property rights, and customs, excise and other indirect taxes. He is also a member of the Board of Trustees of ING Investment Management and the Indian division of ING Bank. He recently was also an independent Director on the Board of Bharat Petroleum Corporation Ltd. Mr. Jagtiani has successfully represented client at various fora including the Indian Council of Arbitration, the International Chamber of Commerce, the London Court of International Arbitration, the Singapore International Arbitration Centre and the Dubai International Arbitration Centre. Live Law: Sir, law as a profession is preconceived to be one in which success easily comes to those who have acquired it as an inheritance from their forefathers. How does it feel to be a self-made man in this profession? Please share some glimpses from the initial struggle that you probably had as a young law graduate. Mr. Jagtiani: Well, you are right in that I am a first-generation Lawyer and to be very honest with you, I stumbled into this profession almost unintentionally. I had intended to do my UPSC exams and Public Services Exams and I was keen on joining the Administrative Services either the IFS or IAS. Therefore, when I was studying for those I opted for Law as my subject. There were two papers in Law. In those days, you had two chances between the ages of 24 and 26 so I decided to make this my only chance. So I joined Government Law College, Mumbai with a view to provide me as my material for those two papers. In those two years, I took Law as a very serious study, spent a lot of my time in the Library, which is exactly in contrast to what I did during my four years of graduation which was one big honeymoon. It`s while studying law as a subject that I got so completely sidetracked and enthralled by it that I decided to end up making it my career. And as a result, I did pretty well in my law subjects. Infact I got excellent grades. But what really helped me was that my foundation in the legal subjects was very very well-laid in both civil as well as criminal because I was really studying it with a purpose in mind so I spent my time reading a lot of reference books, wholesome books and I didn’t touch a single guide book. And then I discovered that law is a fantastic discipline so, I decided to make a career out of it. The passage through the law college was a breeze and Government Law College, Mumbai had an excellent library which rather, fortunately for me most people didn`t use so I had access to some really fabulous reading material. And I must tell this to you, there was a Librarian and I must mention her name, Mrs. Bhibhandkar and she knew every single law book in her library. So when a student came up to her and asked her about some obscure books, she was able to lay her hands on it. In those days, GLC used to subscribe to books like the Harvard Law Review, it had the complete set of British Yearbook of International Law and a lot of books that are usually not available in a usual Law Library. When we needed a book on a particular subject, she would actually direct us to those books which was really fantastic. So studying of law was not a problem. But in those days, of course when you joined the profession, there wasn`t internships like you have now where you get initiated into the law, you understand what the practise is all about because there`s a big gap between the study of the law and the law practise. Students these days get initiated into it gradually. There, the minute you graduated you were then qualified to inflict your skills right from the Mamlatdar`s Court upto the Supreme Court and often times you were thrown into the deep end but luckily, being young and having youth on your side, you breeze your way through it. Frankly, I really can`t think of a struggle that I had to put up with. I love law as a subject and even in my brief less days, I would just sit in the Court and listen to the good lawyers argue and construct their case so as such I really had no problem and that the profession has been really kind to me almost from the beginning so luckily, I eased into it. And of course, you had friends and well-wishers who gave you the initial briefs so, I don`t think I can deal with your question about the struggle because I really had very little of that! Live Law: You attained your Bachelors degree in law from Government Law College, Mumbai and have also been associated with the college as a distinguished Guest Lecturer. Please share a couple of anecdotes from your life at GLC Mumbai and other illustrious legal luminaries that were a part of your batch. Mr. Jagtiani: I actually taught law for about five years as a part-time professor and they were my most rewarding years because I firmly believe that you can take a chance and try and bluff a Judge while arguing your case, try skirt-rounding convenient questions but those students, not only you can`t do that, you ought never do that. So, I took my lectures very seriously and I used to prepare for several hours to deliver a lecture for just half-an-hour or forty-five minutes. And I believe that as a law professor, you need to have a tremendous fund of knowledge if you are going to navigate the class through a particular law lecture. And of course, I must tell you my colleagues at GLC Mumbai were also some people who have achieved a lot in life-the Lt. Attorney General of India, Mr. Goolam Vahanavati was a very good friend of mine though he was an year younger to me, then Justice Gokhale who ended up in the Supreme Court and the present Attorney General of India, Mukul Rohatgi was my student. So, yes we had a lot of these bright sparks. Also, some of my colleagues were extraordinary. I remember some of the Professors-there was Prof. Soli Dastur who was my Professor first, then Prof. Rafique Dada and Lt. Justice Pendse, who was a colleague, so quite a lot of people who distinguished themselves in the profession. Live Law: Sir, you are the Managing & Founding Partner of Oasis Counsel & Advisory which is in association with D. M. Harish & Co. Briefly reflect upon the history of the firm and the future prospects that you perceive. More so, what fuelled your decision to enter the field of corporate law after being a successful litigator? Mr. Jagtiani: Well, I am still a litigator and I don`t really do corporate work on my own. What happened is that I frankly don`t believe that there is in that sense, a strict dichotomy between the various areas of the law. I mean, after all you are still dealing with the area of the law. So, after so many years of being a litigator and having had juniors from time to time, I decided then, that if I really wanted to make a contribution in the area of the law, I could turn my individual practise into a law practise and induct people because of course, by then, after so many years in the profession, you develop a clientele, a network and many of them come to you probably for the purpose of litigation alone, then have other needs-they need documentation where you are constantly dealing with complicated agreements. As I was fairly networked by them, after so many years, then, I decided to get a team who could then address themselves to the Corporate division. So, we converted it from a Law Chamber to a Law Practise and tried to infuse good governance and Corporate Practises that`s how the shift took place. As such, there`s no conflict between one and the other because the Corporate Division is taken care of by people who are skilled in that area. But yes, what I still do is if we have to sign on an agreement, which has been drafted by the Corporate Department, I like to have a look at it as there you are dealing with the client and you are dealing with two parties to a Contract who, then, come and give you instructions to incorporate their versions of what they want the contract to reflect and then, of course, you have to see if it doesn`t fall afoul with the Law so you take instructions but, ultimately, it`s you and the client- you are incorporating his wishes, the question is when that document is then tested in a Court of Law because if the Parties to a Contract fall out and let`s say, when that goes in front of an Arbitrator or a Judge then the question revolves around if your client`s intentions really get captured in the agreement because the other side is always going to try and pull it in his favour and that is where your litigating skills come into it because then you are able to withdraw yourself from a relationship with your client and you see the whole thing from the point of view of an independent Arbitrator. So, even now when the documents are drawn up by the Corporate Team, I like to have a look at it and then stand apart from the document and see how it will come out when it gets into a dispute. That`s how I feel that both these areas of Law complement each other. Live Law: You are someone who is into the perfect blend of litigation and corporate law. The law students often find it difficult to make a choice between the thrill of litigation and the swanky offices of corporate law. What is the ideal approach in face of such a dilemma? Mr. Jagtiani: Yes, you know today it is such that whenever I address a class or speak to students maybe at a seminar, I do ask them this question that how many of you are doing the law with a view to practise in Court and how many of you are doing it to actually confine yourself to office work alone and advisory and corporate work and more hands go up now for the Corporate area of the law simply because this is how the practise is grown. The remuneration is much higher. They are hired by the Law Firms or by Corporate and your starting salary is much higher than what a litigator will get and that is the lure for people opting for Corporate Law. But if you are successful at Litigation then, of course, there`s no comparison because for a good litigator, I believe there`s room at every level-as a junior, as a middling lawyer, as a senior-there`s ample room at the top and once you are knocking there and you get into those echelons then, the sky is the limit. There is absolutely no limit to what you can earn but you got to be patient and obviously, you are not going to be entrusted with a big case merely because you have been a good student; you will have to prove your metal because there`s so much involved as a Litigator! As a litigator, you have to necessarily think on your feet. You have to be quick, you have to know your subject thoroughly well and more than anything else, there`s also such a thing called “Court Craft” and these are such things that you may ultimately achieve them but it takes time. And again, a client who comes to you has a lot at stake so he would rather spend money at that stage and get someone who`s more known, more experienced because from his point of view, it`s a Do or Die situation therefore there`s an enormous waiting. But if you get enamoured with the discipline of the law and you are lucky enough to have a background and you have your own means to sustain yourself then, litigation, in the ultimate analysis, is far more remunerative and also it depends upon your own pre-dialections because many people like the glamour of litigation because you`ve ultimately grown up on law books and law books are all about how you come out as a hero, how you demolish the other side, how you cross-examine and how you make the witness completely expose him. Basically, it`s a question of one’s own appetite! 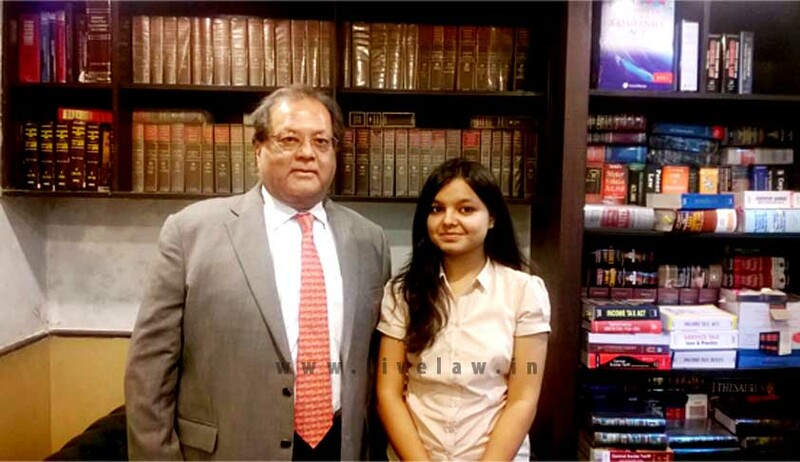 Live Law: You have a high degree of commendation for Mr. Ram Jethmalani, the criminal law expert and an exemplary jurist, whom you have also assisted as a junior in your initial years. Are there any invaluable lessons from your experience with him which have contributed to making your career as gloriously successful as it stands today? Mr. Jagtiani: Well, I`ll tell you one thing-Ram is unique! Ram Jethmalani is unique. I would probably say that he is arguably one of the best, if not the best lawyer that the country has ever produced and I say it for a variety of reasons. I say it not only because of his qualities as a lawyer and someone who is an intellectual, in terms of the law but I say it for the other qualities that he has namely one, his total fearlessness and two, for the causes that he espouses-of course, when I say causes I mean causes that he does Pro-Bono. Particularly let`s say for instance, during the Emergency, when everyone buckled and everyone built it under the tyranny of the government; he was the one lawyer who stood up and spoke vocally till he was virtually driven out of the country. You know the kind of uncertainties during the Emergency- he could have ended up in jail, he could have been tortured and when he preferred to go on exile, there was no surety as to when he would be able to come back to the country. All this has certainly contributed to his greatness as a lawyer but, if you were to talk about his skills as a lawyer which is just unparalleled is because you must know that he is not only one of the finest criminal lawyers but he is probably as sound, if not more sound in Civil Law. Infact, he himself says that his knowledge of Civil Law is sounder than his knowledge of Criminal Law. Also, his originality; he reads the provisions of the law like nobody else does; just by looking at a provision of the law, he will extract from it a meaning which you could never have imagined. You will also see that some of the laws that have come up like the law of Preventive Detention, literally every bit of development is attributable to one or other arguments of his and it`s just his capacity to think so broadly! He is also very humane as a lawyer, extremely sensitive to his clients and I am not saying he necessarily does cases free of charge; when he charges, he charges the earth but only from people who can afford to pay him and probably charges more than anyone else. And I know this personally that probably half, if not more of the causes that he represents are Pro-Bono, are free which he doesn`t even care to talk about. Then, he has got a tremendous presence in Court, tremendous sense of humour and of course, by now, the minute he steps into the Court, he gets all the adulation etc. As to what I have learnt from him, look ultimately you got to teach yourself the law but you can learn from him is all these other aspects because it`s not just one person, when you join the profession you are obviously, very impressionable. You must therefore, look for things that you find attractive and you could learn the law from just about anybody, you can learn it even from a junior or just by seeing a person`s demeanour or how he conducts himself so there`s such a lot to learn. And equally when you imbibe it and people notice it in your conduct then they probably pick up from you so it`s just a question of keeping your eyes ears open. Also, you must learn to appreciate, you must also learn to appreciate your adversaries because after all, if two people go in for a case then one person has a better case than the other so, how a person deals with a bad case is also about learning. This Profession is so fascinating that you are constantly learning and the minute you say that `I know everything!` just know, you have come pretty much to the end or you are just bordering on senility because nobody ever understands everything as Law is an ocean. Live Law: Sir, you joined the Bombay Bar in the year 1971 and India witnessed the infamous Emergency in June 1975. Witnessing the politically turbulent times and such grave human rights violations as a young lawyer back then would have been a pensive affair. Please share with our readers about your persevering role during that period and how the government flagrantly misused their powers? Mr. Jagtiani: Oh! That was according to me a defining moment in my life. I was there in the Bar for about three or four years by the time the Emergency was clamped down and overnight, all the opposition was put in jail. The voice of the people was stifled and all of this was done to shield Sanjay Gandhi from all of his criminalities, few other things happened like Indira Gandhi had lost her elections in Gujarat for the first time and she had lost her own personal election in an electoral battle against Raj Narain so she was unseated and all such things happened and Sanjay Gandhi advised her that if she stepped down and allowed somebody else to step in, she would probably never become Prime Minister again. So under his evil advice, she clamped down the Emergency. Those were very very dark and dreary days. Everyone was virtually scared of his own shadow. In private conversations, you could not speak against the government-the fear psychosis had set in so much. And it was then, that we saw, people like Ram Jethmalani stand out and absolutely defy this sort of tyranny and oppression which obviously was a source of inspiration. We were all supporting him. I was a Professor at GLC Mumbai during that time and I was fairly vocal but, somewhat guardedly and my Principal had told me to be careful in what I say because there were CID Officers who come and visit the class, in cognito pretending to be students. Two of my colleagues were actually picked up and arrested for the duration of the Emergency because they had political leanings which supported the Opposition. Then, we all supported Ram Jethamalani and appeared for him when he was about to be arrested in the famous case and then, came the infamous judgement of the Supreme Court in Shukla vs. ADM Jabalpur where they said that no one could invoke their fundamental rights and challenge their incarceration during the Emergency. Just then in 1977, the government decided to hold a spot election thinking that they would win because the Opposition was in disarray and had been in jail for 19 months. Indira Gandhi was told by her Intelligence Agencies that she would have the Opposition completely trampled upon and she would have the majority in the Parliament so, she announced the elections. I remember very well, I was delivering a lecture on Administrative Law and then, I told the students, “Today, we are not going to discuss the subject at hand. Rather, I want to have a debate as to whether the Opposition should participate in these elections or not?” because they barely had 35-40 days left, after being released, to re-group themselves and fight against the might of the Congress which had unlimited resources in their command. And I must tell you that the majority of the students, almost 90% of them said that even if it`s a foregone conclusion that the Opposition will lose, but we must express ourselves against the tyranny and oppression of the Emergency. So, then I said, “Alright if you really believe it is so, then let me tell you what I propose to do... I propose not to come to college till the election gets over and to form a team and support that candidate who`s going to contest against the sitting Law Minister” because at that time, it was H. R. Gokhale and he had been elected from the Bombay North-West Constituency. And I am very very pleased to tell you that the minute I left College, a whole bunch of students followed me and said, “Sir, we would like to join with you!” I said, “But, then you`ll lose a year if you don`t attend college.” They said, “It`s alright. If you are not going to come, we will take our chances.” Thereon, we actually formed a group under the name of `YOUTH FOR JANATA` (I was pretty young then, so I qualified as a youth). And by the end of elections, we got students from other colleges also joining in... We were quite fired up with the idea so in those days, we got T-Shirts of ours printed `GET INVOLVED-YOUTH FOR JANATA` and that was the slogan- Get Involved! And by a happy co-incidence, the candidate who was chosen to contest elections against H. R. Gokhale was Ram Jethmalani. So, when he announced his arrival back to Bombay because he was in America, teaching in University of Washington, I believe, all of us went to the airport to receive him. We garlanded him and we adopted his constituency and that`s when I became very close to him. By the end of elections, I literally didn`t go home and during the elections, my daughter turned one year and that was the one day, I came back home for her first birthday. We used to spend nights in the slums with all these Opposition leaders like L. K. Advani, Jagjivan Ram etc. and I came to know them all on the first name basis... they all still are very good friends of mine, Of course, you know what the results were! That was really a defining moment of my career and if you ask me as to how it helped me in my legal career then, I would say not directly, but it was so fundamental and so essential to know that how the people value their rights which are guaranteed by the Constitution. When we went to the slums, we saw the conditions they were living in and we asked them who they would vote for and they said, “Fine, you need bread but our liberty is far more important!” So, then, Mrs, Gandhi lost 300/300 seats in the North and it was only in the South that she maintained a bit of her hold. Your constitutional values, your rights really spring to life in times like this and that actually contributes because as a lawyer, you need to be extremely sensitive to other people`s rights, see how valuable they are to the other. It just, in this one sense, makes a more complete education and understanding of the law. Live Law: Thank you sir for sharing such a detailed perspective of your experience during Emergency. You’ve had a close association with Mr. D. M. Harish, an eminent income-tax law expert who also contributed significantly to the law with the publication of Magnum Opus, an 8 volume treatise on income tax law. Please recollect some fond memories of him that you still cherish. Mr. Jagtiani: Well, as you know I am married to his daughter so, he is my Lt. Father-in-law. At that time, he probably had the largest Income-Tax Law practise in the country and yes, before he passed away he wanted to give back something to the profession so, he decided to dedicate the last couple of years to writing a treatise and we all chipped in because I had taught Income-Tax law for two or three years as a professor of law. But I`ll tell you what has been my fondest memories were because as I told you, I used to spend a lot of time preparing for a lecture... and I would like to add that this was probably the influence of the likes of Ram Jethmalani and other great lawyers that I know, I like to read the law in its original rather than being influenced by authorities and textbooks. So when I used to go for lecturing on the Income-Tax Act, I would either in the evening before or early in the morning of the lecture, go over to Mr. D. M. Harish`s house and spend an hour with him, just analysing the section that I was going to discuss in the class that day. So, we would open up the Income-Tax Act let`s suppose, we were doing something on the definition of income, depreciation or whatever and we would look for an interpretation that had either been disagreed upon by a Court or commented upon by a Court and not concluded so as to give the students a fresh look. I taught my Income-Tax Act through the Bare Act though of course, you do fall back on the classical case laws which have helped the field for so long but, my contribution to the class was, in that sense, unfolding and for that Mr. D. M. Harish and I used to spend a lot of time together. He also used to say that he enjoyed it and plus his experience was so vast that we could tell the class not only from the textbook but, because he was in the practise where there is so much more that goes well beyond the textbook- there circulars that are issued by the income-tax department etc. that go around and it was just like making law come alive in class. But I must tell you that the Income-Tax Act, the way it has been interpreted by the Bombay High Court with Justice Chagla, Justice Tendulkar and Justice Tarkunde also at that time, they were assisted by the greatest legal minds like the likes of Nani Palkhivala, Sanat Mehta, R. J. Kolah because they commented on it and therefore, the law books and the law reporters have laid down the basis for the Income-Tax Act way back in the 50s.. when the interpretation revolved around the 1922 Income Tax Act and the 1961 Income Tax Act and till today, those judgements hold good and that`s only because the Judges were Statesmen like Justice Chagla, probably one of the greatest Judges Indian has ever produced simultaneously assisted by the likes of Palkhivala, Seervai.. and that way the foundation is so solid that the Case Laws still hold good and this is why the rigorous provisions of the Income-Tax Act are still acceptable because they have imparted to it so many equitable principles. And I dare say, had that not happened one really doesn`t know how rigorously and inequitably the income-tax act would operate right now. Unfortunately, that is not happening to the new jurisprudence that is coming in the country. If you see the new Acts like the Debts Recovery Tribunal or for that matter, even the Consumer Protection Act, because the jurisprudence has not been properly laid down and the Judges and the lawyers who have probably been assisting, have really not made their contribution. The Judges who man these Tribunals are of a very very mediocre, average or poor standards and therefore, the foundation not being properly laid down, you have all sorts of aberrations and not only that, these Tribunals not even work. On the other hand, the income-tax Tribunals, at least upto a certain point of time, was really a beacon light as they understood the law as laid down and interpreted by the Judges that I have just mentioned. But, the recent jurisprudence has really gone completely wrong. Live Law: With an experience spanning 44 years at the Bombay Bar and having had immensely high-profile clients like Shri Madhavarao Scindia, Mr. Sachin Tendulkar, Mr. Pesi Shroff, Mr. Mohinder Amarnath to name only a few, how do you look back on this enthralling journey? What would be, according to you, the most challenging case of your career? Mr. Jagtiani: Well, these were clients that came much later to me in my profession and of course, all of them were wonderful human beings. Madhavrao Scindia, I knew him more as a friend and Sachin Tendulkar, I used to advise him on his Contracts and Pesi Shroff was a Jockey in those days who got into some problem with the racecourse and Mohinder Amarnath was another cricketer that I had represented when he had called the selectors a bunch of jokers when he had been unceremoniously dropped and that became a huge sensational matter where he was fined for using such a language and we challenged that saying that it`s our personal opinion of the selectors and then can`t punish me for having an opinion of them and that doesn`t amount to misconduct because you can`t prevent me from thinking what I think about individuals.. but something unique about all these was that they were completely grounded in their particular profession and very respectful and great people to deal with. And now to answer as to what was the most challenging case of my career-well curiously, it had nothing to do with these people but, very early I had an opportunity to defend a friend of mine, if I may add a fellow musician because I play music myself and this person used to play along with me in a band.. we had a band in college and he then, became a little wayward and he then, got into the drug scene. Again, I must say he was extremely bright and brilliant but became a victim of drugs and then, was involved in a homicide. So, one day I was on my way to Calcutta for a case and I got a letter from him, from jail which begins with that... “I wouldn`t be surprised if you just tore this letter and ignored it but I am sitting in jail and you must have heard why I am here and your name has cropped up by some inmates in the jail whom you represented and when I heard your name I told them that you are a friend of mine so that`s why I am writing to you now...” ( because we had lost touch for a few years in between)... So he said, “I can understand if you are disgusted with this but I have a side to this whole episode if you care to listen to it and will you come and see me?” So, of course I told my wife to immediately reply to him saying, “I am on my way to Calcutta”, and when I come back I`ll reply to him. When I came back, I got in touch with him and went and heard his story. Then, I asked him, (His name was Jimmy) “Jimmy, are you sorry for what you did?” And he said, “You know, this sorry is such an inadequate emotion that what`s the point of saying sorry but, yes I am but, that`s only the starting point because there`s something that I can`t undo but, listen to what I have to say.” So I heard him out and if I fill in one more detail of this case, you would be somewhat shocked...The homicide was that he had ended up in a frenzy dual killing his mother but, there was a big big history to that. And well, I eventually did take up the challenge and succeeded so, he was able to walk out. Live Law: Sir, there are many fresh law graduates who look forward to join Oasis Counsel & Advisory. What do you seek in the young lawyers aspiring to join your firm? Mr. Jagtiani: See it`s not what I seek in them. It`s what they should be looking for when they join a firm like this. Particularly, the interns when they come, one thing that I certainly want them to end up is to expose themselves to, because we have a fair variety of cases, dealing with Constitutional issues, Commercial issues, Companies Act, Copyrights, Intellectual Property Rights, Criminal Cases and all that... and in that sense, I personally believe that when you are learning and when you have just joined, don`t get into a particular area of law and give it preference over the others rather, just expose yourself to all because the law really can`t exist in compartments-even if you are dealing with a case dealing in Contracts Act, there`ll be so many other aspects and it can`t be confined to just one Act, there`ll be issues of Partnership, issues of Limitations, then of Intellectual Property Rights so, therefore, the law just cuts across. So, I just tell my young colleagues that expose yourselves to as much because right now, you have the luxury of not having to fend for yourself. You can make as much mistakes as you can, no one is going to get hurt and even if you make too many mistakes you`ll probably just fail an exam but, this is your time to imbibe as much as you can because when you come into the real world, that luxury goes away and goes away very fast. So, at the moment just absorb all that you can and that`s what I like the interns to do when they are here. You already know the law in the textbook but, when you are trying to communicate about the same to the Judge, who`s a third person, a lot may either be lost in translation and that`s why you must understand how your perceptions are seen by someone else who`s impartial and who`s wiser than you. What I seek in them is of course, to be dedicated to his task as it is in our firm that we are pretty easy as far as timings are concerned, as long as you do your work at hand and you don`t leave the client high and dry.. he can`t just come back and be told that his document is not ready because you decided to see a movie instead then, that is just not acceptable. You see as many movies as you like, you take as many vacations as you like but, you can`t not do what is at hand. And, in that sense, therefore it`s a very easy place to be in as what I want to inculcate is what their sense of responsibility because I know full well, that when someone joins a firm and for that matter, any firm, obviously, he is not going to be there permanently.. You never own a lawyer! He is there to gain his experience and to make his contribution while he is here and he is obviously going to use it as a springboard for his future and it must be that way... because you know if he is happy with you and he decides to go off that way then, he is only going to spread your goodwill only so it necessarily must come back to you. Live Law: Sir, it`s awe-inspiring to know that you have come so far in the legal profession as a first-generation lawyer. What is your message to the young lawyers who are setting out in this profession? Mr. Jagtiani: My message is very simple: No quick-fixes in the law! If you want to make money, it is guaranteed that you will make money but, not quickly. The minute you decide to opt for a quick-fix and you know what I mean, find shortcuts, compromise on your integrity, compromise on the integrity of the system, as far I am concerned, it`s all over. Therefore, my message would be, particularly, if you are into litigation, you must have the patience to wait. Success will follow you; it cannot avoid you. It`s like a shadow; it must necessarily follow you. And another thing of course, is hard work, it`s not going to come on a platter. There will be ups and downs, more downs than ups but, it has to come. The minute you decide that I want to be rich in a hurry then, well, you probably may but you will be rich without friends, without satisfaction and you will spend many many sleepless nights.